So I have been looking for a milk goat to join the team. Today I finally found on and already got some of her liquid gold. 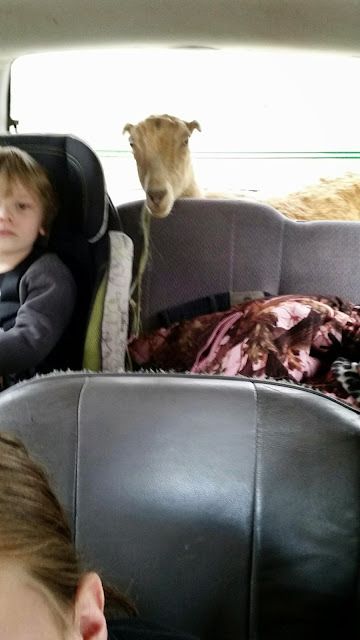 Yes you might be a redneck if you go get a goat and load it in the trunk area of your minivan full of children. :) She made it home safely and she did not poop or pee in the back so that was a plus. I introduced her to the other animals and the other goats. Of course Our other nanny, Charlotte, was a little jealous of sharing her space. Billy of course was like, "oh a new girlfriend", he was not so happy that he was not allowed near her. 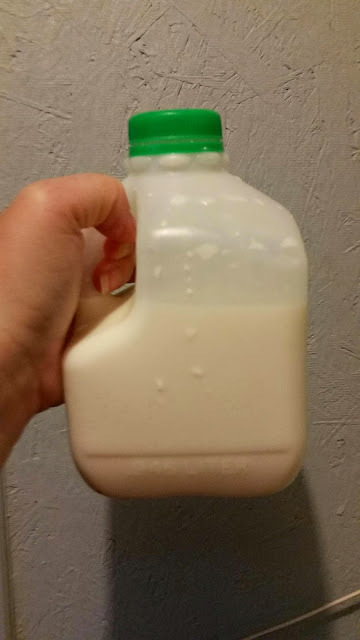 Then the time came to milk her. She did great for being in a new place. I did great for not having milked a goat in ages. I would have gotten a full quart out of her but it was storming and the other goat got out and shoved me and I spilled a ton. We shall see how morning does for it.